Founded around 387 BCE, Plato’s Academy continued throughout the Hellenistic period until the death of its last head, Philo of Larissa, in 84/83 BCE. The most famous student during that time was Aristotle, who after studying at the Academy for almost twenty years went on to tutor Alexander the Great in 343 BCE, and then started to teach at the Lyceum in 335/334 BCE. A group of Neoplatonist philosophers revived the Academy at the beginning of the fifth century CE, and it again flourished until 529 CE, when an edict of the Emperor Justinian I. brought about the closing of all institutes of higher learning in Athens. The Academy was one of the earliest such institutes in the Western world. Besides what we now call philosophy, the subjects taught likely included physics, mathematics, and astronomy. Today, the archaeological site of Plato’s Academy is in a sad state of neglect: trash, eroding walls, rusty fences or no protection at all, and only very few informational sign boards. Given the current financial crisis in Greece, this is unlikely to change anytime soon. 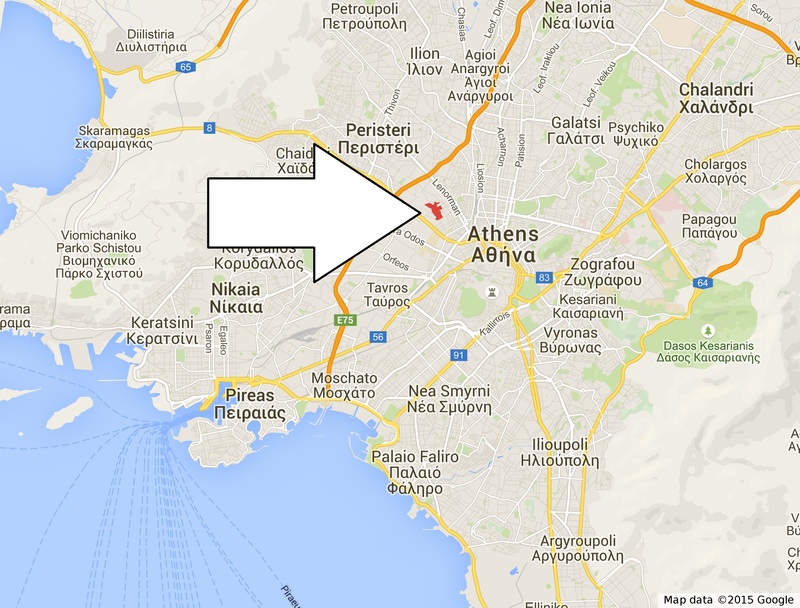 The likely site of Plato’s Academy is located in the northwestern Akadimia Platonos subdivision of the Greek capital of Athens (Fig. 1, red), about 3 km from the Acropolis of Athens and only a few hundred meters north of the Agricultural University of Athens. The GPS coordinates of its center are 37° 59′ 33” N, 23° 42′ 29” E (click here to view on Google Maps). The site is open to the public, and there are no entrance fees. The archaeological site of Plato’s Academy is today used as a public park. The park’s name is Archeologiko Parkoo Akadimias Platonos, and it is divided into four parts by Drakontos Street (Fig. 2, blue) and Monastiriou Street (Fig. 2, red). The closest metro station is ΜΕΤΑΞΟΥΡΓΕΙΟΥ (Metaxourgio; Fig. 3, A), which is located on the Red Line (M2) of the Athens Metro. If you are coming from the city center (metro stations: Syngrou Fix, Akropoli & Syntagma), you have to take the M2 towards ΑΝΘΟΥΠΟΛΗ (Anthoupoli). 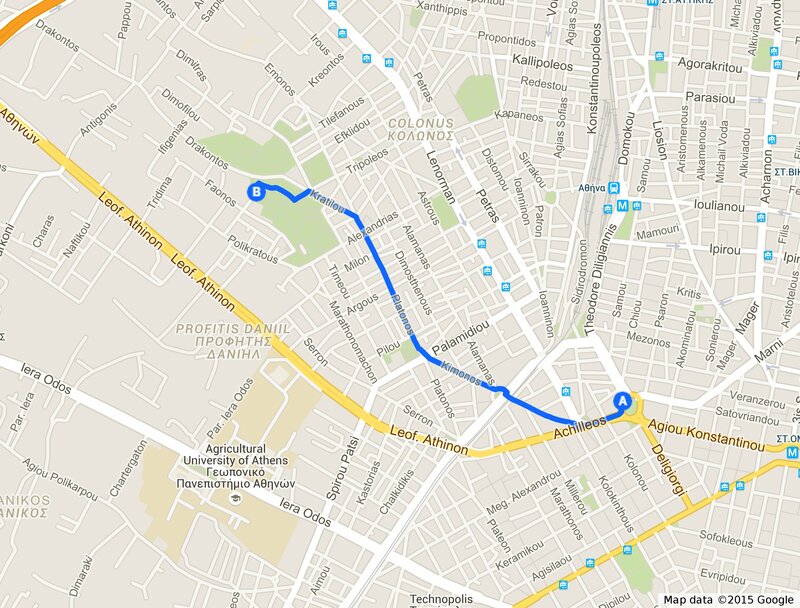 From the ΜΕΤΑΞΟΥΡΓΕΙΟΥ metro station, it is a 20-minute walk northwest to Plato’s Academy (Fig. 3, B). Alternatively, you can take the bus. You get on Line 51 at the bus stop on Achilleos Street that is just a 2-minute walk from the ΜΕΤΑΞΟΥΡΓΕΙΟ metro station and has the same name. The bus runs about every 10 minutes during the day (Monday to Sunday). 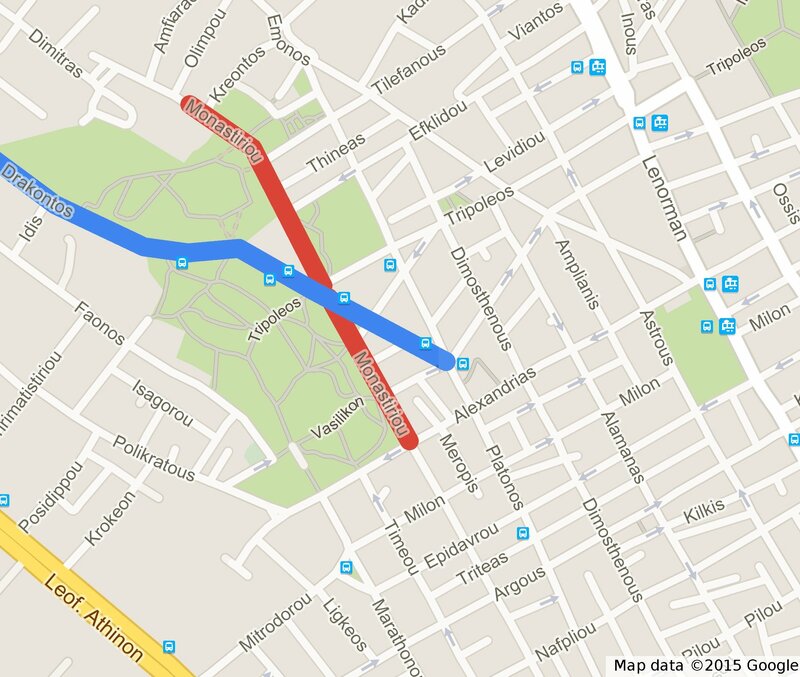 Get off the bus after 6 stops at ΠΑΛΑΙΟ ΤΕΡΜΑ (Palaio Terma), which is located right next to Plato’s Academy. If you are interested in Plato and his work, a good place to start is the Stanford Encyclopedia of Philosophy entry on Plato at plato.stanford.edu/entries/plato, by Professor Richard Kraut. Links to the texts of Plato’s dialogues are available here.